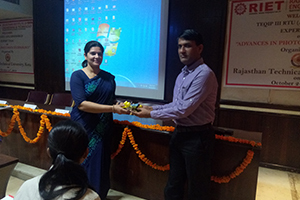 The Department of Electronics & Communication Engineering, RIET, Jaipur organized an Expert Talk On ADVANCES IN PHOTONICS TECHNOLOGY, on 24th October 2018. 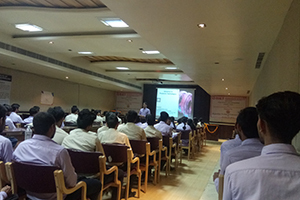 The speaker of this expert talk was Dr. Ghanshyam Singh, Professor, MNIT Jaipur. It was attended by all the staff members and students of EC, EE & EEE Departments. 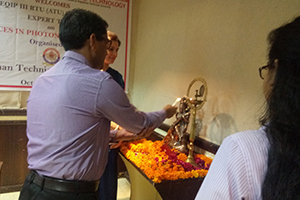 The session started with lamp lightening at 9:30 am at Seminar Hall Admin block with the floral welcome of the chief guest Dr. Ghanshyam Singh by the Principal Dr. Saroj Hiranwal. 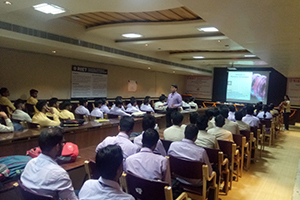 During the session Dr. Ghanshyam Singh motivated and inspired the students towards the role and importance of photonic devices and systems for communication and the use of photonics in data storage, data manipulation and displays. He also briefed about the recent advances in the science of photon generation, detection, exploitation through emission, signal processing, switching, amplification and also the properties of light, study of interactions with matter and the construction of instruments that use or detect it. The session was concluded by a thanks giving note. 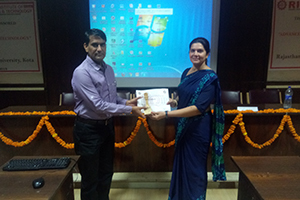 Memento and a certificate of appreciation were presented to Dr. Ghanshyam Singh.